Single, bilingual or ready to mingle? 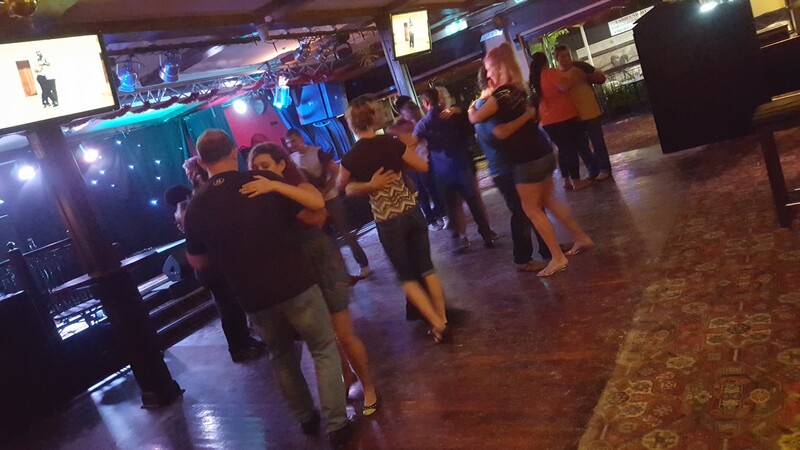 The Danza Loca Crew run Perth’s most popular weekly Salsa classes and parties, including the famous “Havana Jam” at the Mustang Bar, 46 Lake St Northbridge. For beginners, come try our FREE INTRO LESSON, Tuesdays at 7pm. After that, you’re ready for our structured Cuban style Salsa Classes and to party on until midnight with the Danza Loca Crew, live percussionists and awesome DJ team! In addition to our authentic Cuban style syllabus, we also offer 90 minute studio classes in “Club style” Salsa, incorporating the best “linear” techniques and combinations developed around the world. A lot has happened with Salsa since it ventured out of Cuba, and you’re going to love it! Kizomba is one of the most popular genres of dance and music originating in Angola. It is a melting pot of influences, taking it origins from traditional semba with Angolan merengue and Kilapanda (traditional Angolan music). As a result, Kizomba music emerged as a more modern music genre with a sensual touch mixed with a pulsating African rhythm, it is characterised by a slower and usually very romantic rhythm, sung generally in Portuguese but also more recently in French. In Angola in the 1950s the expression Kizombadas referred to a party. There was no association of the word to a dance or musical genre. Later people associated a “Kizombadas” or party with the traditional style of dancing being displayed at these parties (such as Semba), and so was born the word Kizomba to descibe the dance that was taking place. Kizomba is popular for having a slow, insistent, sensuous rhythm. It is danced accompanied by a partner, very smoothly, slowly and sensuously, and with neither tightness nor rigidity. There are frequent simultaneous hip rotations coordinated between dance partners, particularly in the quieter refrains of the music. Kizomba has been in Australia since around 2008 but only from 2012 has it started to sky-rocket in popularity, starting in Sydney and Melbourne and now in Perth! Dominican Bachata, also known as original Bachata, contains a side-to-side motion and is filled with lots of footwork and freestyle moves. With more bounce than other types of Bachata, dancers alternate between the close and open positions, and do not perform many turn patterns. Bachata Moderna or Modern style Bachata, is the next evolution of Bachata dance that incorporates other styles of dance, as well as the concept of crosses. Bachata Moderna has much more styling, slides, intricate footwork, accentuated movement, etc. Bachata Sensuave or Traditional Bachata. Initiated in the United States and Europe, traditional Bachata is the most common Bachata style danced all over the world. A very romantic Bachata style, partners have a very close connection. This form also involves turn patterns and dips. Bachata Fusion or Urban Bachata. Characterized as a fusion of Modern Bachata and Hip-Hop, Bachata Fusion is a fast-paced Bachata with an urban flavor. This style of Bachata is danced in all directions (not just side-to-side) and integrates new elements of sharp musicality, turn patterns and urban attitude. One of the leading bachateros in the urban Bachata movement is Alejandro Rey Mendibles from LA. Ready to learn these amazing styles? Click the button below to find a class that suits YOU!